Zestos: Enabling life through communication of research: Commercial orange jucie is good for you ! I am rather suspect of any commercially produced and mass marketed "health" product. The more processing involved the more the nutrients get destroyed. In vying for a mass market price is going to be sensitive. Therefore the companies are going to go for cheaper and fast, rather than healthier and more wholesome. Therefore I am very suspicious of orange/citrus juices. If you read the label they are often made from reconsitutted orange jucie. A typically process would be grow oranges in California. Make juice from said oranges. Sterilize/pasteurize the orange juice. Then dehydrate / dry the orange juice as water is heavy and waste of energy to transport. Then ship this juice across the Pacific to New Zealand. Filter Auckland city water, remake juice and put into plastic bottles. So when people say drink orange juice..... I question if there are any health benefits. 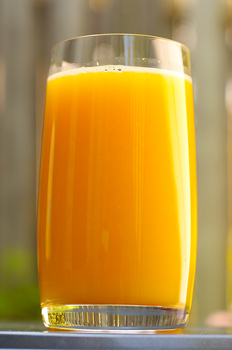 Well it turns out that a pint (500ml) of orange juice actually reduces oxidative stress. And this reduction of oxidative stress was the same as a 500ml drink of water plus a hesperidin. This is a plant compound that is high in oranges. Thus it must be rather stable in processing. I should also point out that the supplement was just as good as the orange juice. Yet another example of supplementation working. (For the record drinking home made fresh orange juice would be the best thing).